The most distinctive landmark of the Detroit skyline, Detroit's Renaissance Center was a bold attempt to revive the dying downtown district in the 1970's. 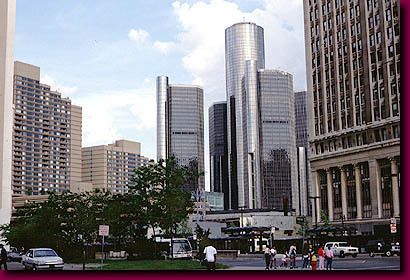 Recently General Motors purchased the Renaissance Center and is moving its corporate headquarters there. To the left of the center are the 1980's buildings of the Millender Center. On the right is the Albert Kahn designed First Michigan Building. What is this picture doing in a ruins site? In spite of what has preceded I am pleased to report that Detroit is energetically rebounding. Beyond the highly profiled new developments, there has been an encouraging and increasing number of historic preservations.